J.R.R. 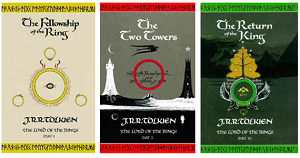 Tolkein’s timely masterpiece The Lord of The Rings is often cited as the most inspirational fantasy trilogy of all time. Set in Middle-Earth, it charts the adventures of Frodo Baggins and his Hobbit friends as they travel from their home of the Shire to the mountains of Mordor in order to destroy a powerful ring that corrupts the life around it. They are joined by the legendary wizard Gandalf the Grey, and a group of adventurers known as The Fellowship of The Ring. The trilogy explores themes of power, corruption, heroism, tradition, honour and friendship. The trilogy is considered the second best-selling novel of all time with over 150 million copies sold since its release. Initial reviews of The Lord of The Rings were mixed. A good number of critics felt it was a masterpiece, the finest work of fiction in the Twentieth Century. One reviewer stated that it outdid the literary impact of John Milton’s Paradise Lost. Some may find flaws in the work ranging from the lack of psychological depth to the goofier, childish moments of The Fellowship of The Ring, but these are minor in what can referred to as a work of art.